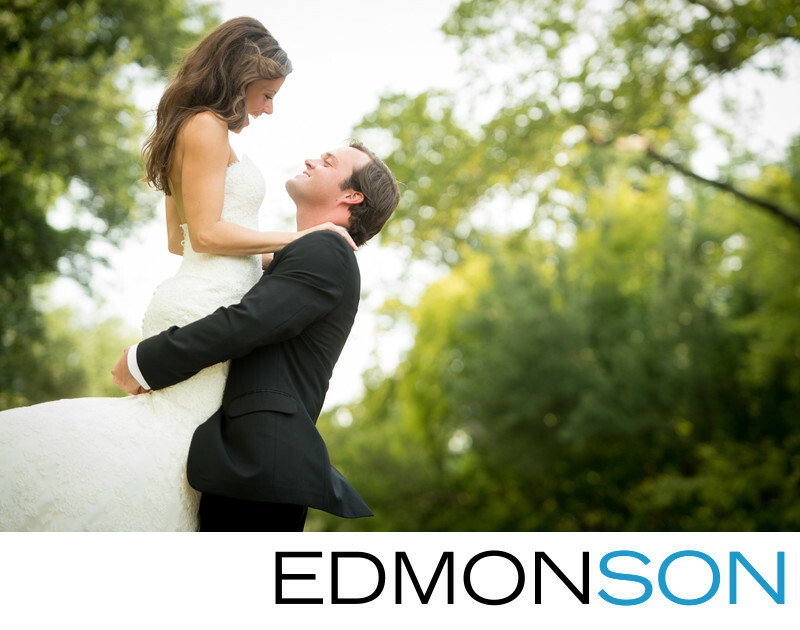 Taking outdoor wedding portraits is a great way for Park Cities brides and grooms to capture the beauty of Dallas's scenic parks, water, and trees near Turtle Creek. In this photo taken outside the Bride's home on Turtle Creek in Highland Park, there is a such joy and energy as the couple shares a laugh as the groom lifts her into the air. This is a great photo to take on your wedding day or in this case, a year after your wedding. Realizing that they did not have many photos taken together after their ceremony and before their reception at Brook Hollow Country Club, this industrious bride choose to put her dress back on a year later to capture even more wonderful memories. The fact that the session fell on her birthday made it "the best present ever", she said. One of the things we noticed is just how relaxed the newlyweds were with each other without the additional pressure of normal wedding day activities to considered. In the late afternoon, after shooting other portraits around their home, we stepped out on their tree-lined street to capture this warm natural light photograph. Her laugh not only is contagious, it's the emotional energy that communicates to anyone who sees this photo just how much fun they are having together. Their wedding was coordinated by DFW Events. 1/500; f/4.5; ISO 400; 122.0 mm.